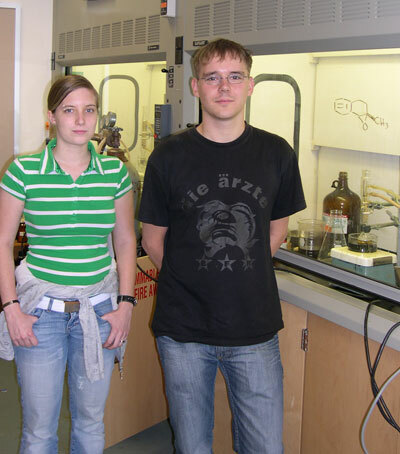 University of Siegen graduate students Laura Thomas and Christoph Kohlhaas make the compound 2-methyl-3,4-dihydronaphthalene oxide (drawn on the window to the right), photolyze the molecule and isolate the product as part of their exchange practicum at SHSU this August. SHSU’s chemistry department has added two components to the mix this summer that are helping to create a reaction. As part of an exchange program with the University of Siegen in Germany, Siegen chemistry graduate students Christoph Kohlhaas and Laura Thomas will spend the month working with professor Rick White on research he’s conducting with professor Benny Arney. Working in the field of epoxide photochemistry, Kohlhaas and Thomas are creating compounds to see what happens when the molecules are photolyzed—or broken down with light. “It defines how things happen on this reaction pathway; we have narrowed down the ways that things can react,” White said. “What we’ve done is uncovered things that are wrong in journals from years ago because we have newer techniques now. We have uncovered some new processes that we didn’t know before. While SHSU has sent two students to Siegen since the exchange began, Kohlhaas and Thomas are the first students who have come to the U.S. through the program. White, who has spent numerous summers working in Germany, was instrumental in helping create the exchange program with Siegen and also with bringing the students to SHSU. While they have only been in Huntsville for a little over a week now, two things have already stuck out: “the people are all very friendly” and “it’s very hot,” she said. While they haven’t seen “many cultural differences, not so far,”—aside from more patriotism here, only visible in Germany during the World Cup, according to Kohlhaas—coming from a city where really hot days are around 90 degrees has been a big adjustment. Along with the friendliness of the locals, Kohlhaas and Thomas said they find the work environment is also a good one. This aspect of the exchange—the different approaches to teaching—is what makes the program work, White said. “They can come here and have a looser schedule, and we can go there for the expertise they have,” he said. “They have Spectra run by their guys but we do it ourselves here, which kind of gives it a more broadly-based training. They’re gaining experience they wouldn’t have there, so it works out both ways. “They’re very good at what they’re doing,” he added. Siegen also has different scientific focuses than SHSU. Other than a trip to Houston and doing some shopping, Kohlhaas and Thomas said they don’t have any other plans before the leave on Aug. 29. When they return to the University of Siegen, they will go back to work at a lab there before classes resume in October. “When we will come back to Germany in September, we will go on with our work in the organic department,” Kohlhaas said, adding that he and Thomas have been working together since 2004. “We synthesize some compounds for a PhD student, who writes her thesis about DNA binding materials. After earning their master’s degrees, both expressed interest in continuing with research and working on their doctorates. “It’s hard to say about the future,” Kohlhaas said. “You must be grateful to get a job in Germany because it’s really hard to get a job. You should choose (take) what you get.